Press releases (news releases) about your small business can be distributed through online and conventional media sources. Press releases help market your small business by highlighting news or events related to your small business. If you deliver your release by mail, hand, or fax, prepare your story in the long-standing form of a printed release. The hard-copy printed release is becoming something of an antique in a world where news is increasingly submitted electronically, but the format is still the basis of official news announcements. E-mailing news releases is immediate, cost-efficient, and effective — if you take a few steps first. Start by checking media outlet websites to find out their news submission specifications and to obtain editorial e-mail addresses. Or contact the assignments editor at your target media outlet, or better yet, the editor you hope will handle your news. Explain that you have a news release you believe is of interest and ask if the editor prefers to receive submissions by e-mail. The editor will likely ask the nature of your news, in part to provide accurate delivery directions, so be ready with a one-sentence answer. If the editor prefers electronic delivery, confirm the e-mail address. Also ask whether the editor prefers the release as an attachment or typed right into the e-mail message. Don’t make assumptions. Most editors won’t open attachments, so never send them unless requested. Type your subject line in uppercase and lowercase, presenting a short headline for your release that can be read, in full, even on a mobile screen. For example, Hometown Landscaping Free Waterfall Workshop. If the release comes from an e-mail address that includes your business name, you don’t need to repeat it in your subject line. Write and send your e-mail in plain text. Don’t use HTML or other markup languages, as they can reduce the readability of your news. If possible, start each e-mail message with a customized line. For example, you might use News Release for [name of news contact] at [name of media outlet], followed by a short description of why the story is a good fit for the editor, reporter, or blogger’s audience and what type of coverage you’re aiming for. Paste your release into the message box. Your release should begin with the words For Immediate Release and follow the content instructions for standard printed releases. Unlike printed releases, however, e-mailed releases are single-spaced except between paragraphs and are edited down to 500 words or fewer. Include hyperlinks that lead to supporting information or product landing pages on your website. The links provide helpful information to reporters or editors preparing stories based on your release, and they’ll appear in any media outlets that post your release. Don’t attach files, photos, or artwork unless the recipient has specifically instructed you to do so. Instead, include a link to your website, where high-definition artwork is available. Print a copy of your e-mail release so that you have a reference copy handy when editors respond to request additional information. If you send an identical release to those on your media list instead of sending tailored releases to individual media contacts, take great care not to reveal the names and addresses on your list. Instead, use an e-mail group or distribution list or send the release to yourself with all recipients listed in the blind carbon copy (Bcc) field. Increasingly, media outlets emphasize art in their page designs. They need good images to accompany stories, which presents a great opportunity for businesses that submit photos or graphics in easily usable formats. Start with a clear, well-exposed image that has good composition, good focus, and interesting subject matter. Submit an image that’s at least the size you hope it’s going to appear in the media outlet or, better yet, the size the editor has requested. Prepare your photo or art for adequate digital resolution before sending. Obtain permission to submit artwork before attaching your file to an e-mail message. 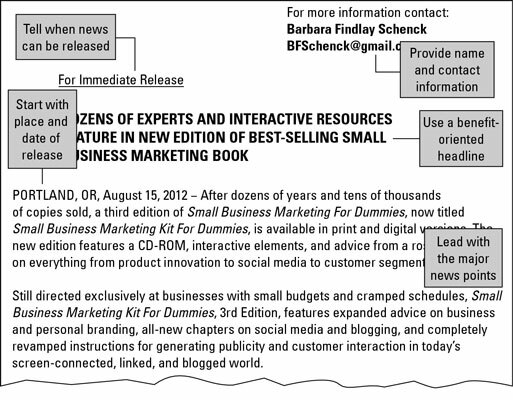 When writing the e-mail that accompanies the file, type your caption into the subject line (for example, “Photo: Small Business Marketing Kit For Dummies book cover”). In the message box, type your cutline, which is a more detailed caption of the photo or artwork. If your photo includes people, include the complete names of all who are recognizable. (Keep in mind that publications rarely use photos featuring groups of more than four.) Close your e-mail with your name and contact information. Most media outlets can receive your image if you compress it and send it in JPEG format. Transmit your image in RGB (red, green, blue) color format if possible. Most images originate in RGB; it’s the most common color mode for viewing digital images on-screen and the default setting in photo software. If you’re submitting a digital photo, change the file name designated by the camera (which is probably something like DSCN0015.JPG) before submitting. One last step: Be patient. Your image may not be used this time, but if you’re a good, reliable source, in time your efforts will pay off.